Supervision of Windows servers with Centreon often passes through the use of SNMP and / or the famous NSclient ++ software and acts as a real supervisory agent, compatible with the NSCA and NRPE functions. Although it integrates natively different modules including check_nt to check the use of CPU, RAM, disks, etc. It may be necessary to do more detailed, more personalized checks. By means of Nagios Remote PluginExecutor (NRPE), we will be able to execute scripts locally on the Windows server and then return the information to Centreon. In this tutorial, we will see how to configure NRPE to execute scripts, in this case PowerShell, but it also works with other languages ​​(VBS, DOS, Python, etc.). We will assume that NSClient ++ is already installed on your server, but it is not sure that the NRPE is active! It all depends on the options selected during installation. 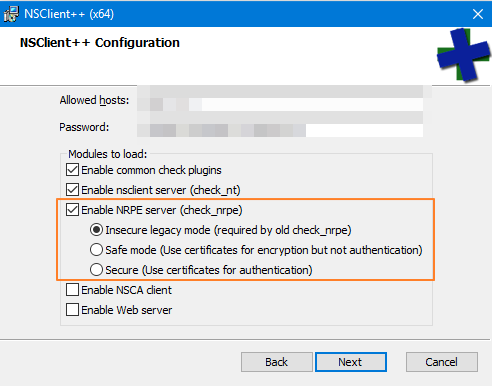 If you are installing, here is how to configure NRPE (after all depends on the monitoring solution that will query NRPE). For the change to be taken into account, it will restart the service but before that we will continue the configuration. Still in the nsclient.ini file, we will declare the external scripts that we want to use. In my example, this will be the PowerShell script "check-dhcp-failover.ps1". It is imperative to store it in the "scripts" directory of the NSClient ++ installation folder. The name of the command / plugin that can be used in NRPE is "check-dhcp-failover" and then we indicate the path to the script. To add another script, it will not be useful to include the line "[/ settings / external scripts / scripts]" but only to declare another script under the first one. Finally, we will check that it works, we can test the script from the server directly, before switching to the Centreon. We will validate a first step with the command "test nscp.exe" followed by the name of our plug-in declared in nsclient.ini. The last command entered above must return the check status of your script, ie the state / value that will be sent to your Centreon. Congratulations @jemmy! You have received a personal award!